The place is called Lather, and it’s here in Pittsburgh. I allowed mum to drag me into the building, with only a little resistance. I did indeed remember this place. It smells good. Smells like dog. And there were indeed lots of dogs there getting baths and haircuts. I wanted to look badass, but lets face it, I was just there to get my nails did. To say that I have some issues around these sorts of things is putting it a little kindly. The sights, sounds, smells, all made me more than a little nervous. It’s hard to look cool when you’re running away from a blow dryer that a tiny fluffy dog isn’t even phased by. So I thought, maybe I’ll just try to relax into this a bit. I got me meet my new groomer Alison, and you know I just kind of liked her right away. She let me take my time getting to the grooming area in the back, and didn’t make fun of me when I tried to make a break for it out a side non-exit. A big, strong guy lifted me up onto the grooming table (yeah, there was no way I was getting onto that willingly), and with two quick attachments around my neck and under my back end, I kind of felt calm. She went to work on my nails and it didn’t bother me at all. Of course with mum feeding me bits of hot dog (don’t judge me), it was easy to kind of zone out a bit. Then they got to talking about getting me a proper haircut. I am indeed a bit fuzzy and overgrown, and honestly I wouldn’t mind getting rid of some extra that’s weighing me down. Alison was excited to see an Airedale (I understand), and she and mum were talking about proper shape for a fine male Dale. It might take some time, but they were both concerned about me having a good first experience (appreciated). 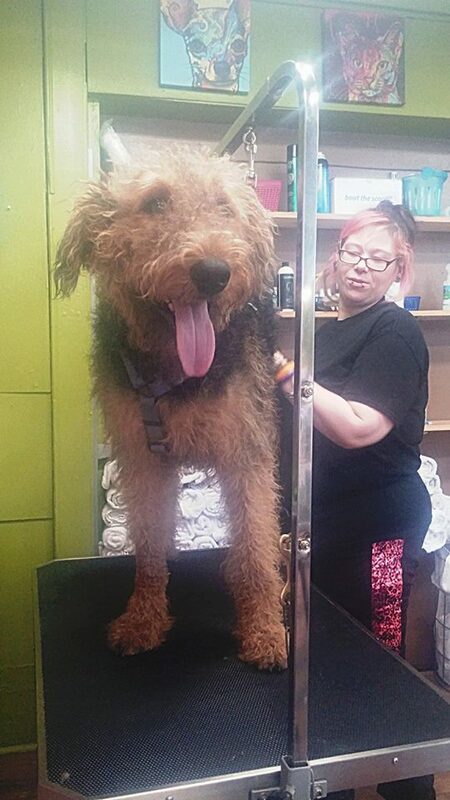 So before I knew it… I have an appointment for a full groom later this summer.